This web space is dedicated to the forthcoming International Jumping Competition 1*, Ladies 1*, Young Horses 1* & Am.A - Nice Winter 2019 . It will attend to provide you the most complete information about this event which will take place February 28th to March 3rd 2019 within the Horse Riding Club of Nice. 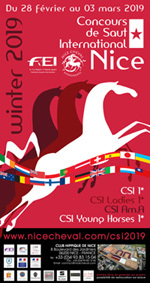 The Horse Riding Club of Nice has been approved by the FEI (International Equestrian Federation) to conduct ,this year, two International Jumping Competitions : CSI* Winter 2019 (February 28th - March 3rd) & CSI* Winter 2019 (August 8th - 11th). Those international meetings concretise the ambition for the Equestrian Club of Nice to stand as a new venue for high level competition. Thursday February the 28th to Sunday March the 3rd, worldwide riders will challenge themselves during 3 days of intense competition. 21 jumping tests: 9 CSI 1* tests (Small, Medium & Big Tour), 3 CSI Ladies 1* tests, 3 Young Horses 1* tests, 6 CSI Am.A tests (Small & Big Tour) are programmed for this event with obstacles from 1,05 to 1,40 meters height. Show jumping is to follow up an obstacle course without fault (course of 10 to 13 jumps). The tests are intended to show in the pony / horse its frankness, its power, his address, its quickness and its respect for the obstacle and for the competitor, the quality of his riding. Show jumping is the discipline leader in France. It represents over 80% of the competitions, both in terms of competitors, as tests or competing commitments. Scoring: The aim is always to jump the course in the designed sequence with no mistakes – a clear round. If any part of an obstacle is knocked down or if the horse refuses a jump, penalties are accumulated. The winner of the competition is the horse and rider combination that incurs the least number of penalties, completes the course in the fastest time or gains the highest number of points depending on the type of competition. For most competitions two types of scoring table are used : Table A and Table C. The most frequently used scoring table is Table A. Each fault is penalised with a certain number of penalties. Each bar knocked down draws a sanction of 4 penalties, as does the first refusal (this is when the horse stops short in front of the jump or goes around it). The second baulking or refusal, as well as any fall, will eliminate the horse and rider. The classification is established according to the penalties obtained. remaining before opening of this competition !!! 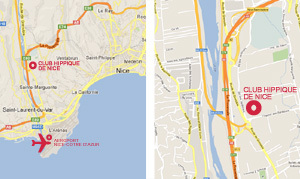 This competition is organized by "Nice Cheval Evenements". DRAFT SCHEDULE . The official draft schedule for this competition CSI 1* has been uploaded on our server.